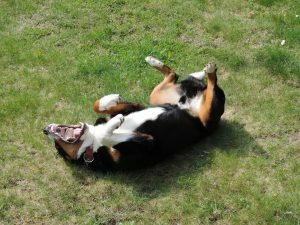 Dogs Lying on Their Backs – Why Do Dog Do That? Dogs lying on their backs – why do they do that?! Often we have seen dogs lying on their backs — legs in the air — and rush to the conclusion something is dreadfully wrong! The first couple time we found Annie out in the yard lying on her back – legs in the air –it panicked us thinking she was seriously sick. Urgently rushing to rescue her, she would leisurely open her eyes, lick her lips and ask for a tummy rub. Many of us dog owners have experienced these similar moments of panic seeing their dogs lying on their backs. Why do they do that? 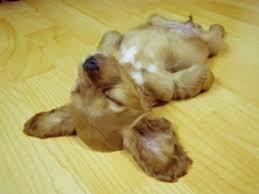 Dogs lie on their backs for the simple pleasure of it – especially when they are planning on taking a nap. A dog who sleeps on their back is really comfortable and feels very safe. That should make us happy to know our dogs are feeling safe, because in my opinion, when a dog feels safe it brings out the best in them. Plus it is impossible to underestimate the sense of security a dog must feel to expose their softest, most vulnerable part – their undersides. Dogs naturally keep their belly’s protected and out of sight. Dog often lie on their backs as a means of temperature control. The sparse fur on their bellies allows the breeze to reach their skin more easily and cool off. Another reason we find dogs lying on their back is to get some sun. Other than their noses, the tummy is the only place that is not covered with thick fur. Annie suns herself on her back and you would think she is in heaven. Also, is there a better way to invite a belly rub is to lie on your back? 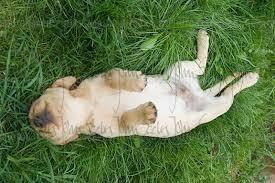 Roll over, splay the legs and put their bellies in the most “tummy rub accessible” position. Our dogs are are very wise. Do this once and get the belly rub you had hoped for — well, this should work over and over again. Why Do Dogs Sniff the Butts of Other Dogs? Ten Dog Breeds that Love to Show Affection. We’ve all heard that owning a dog is good for you. According to the website Psychology Today, dogs are known to increase your quality of life as well as your longevity. Pet owners typicially have lower blood pressure and lower cholesterol that non-pet-owners! If you don’t already own a dog, here are some breeds to check out if you love dog snuggles and cuddles. Best Selling Pet Books from the New York Times. Do you love books about Pets? Here are the latest Best-Selling Pet Books. Plus, they make GREAT gifts for that pet lover in your life. Mass Wedding of Dogs takes place in China. Dog lovers in China got together recently to take part in a mass dog wedding. It took place in a lovely park in Beijing and featured 42 dogs getting hitched.